Foodies may well be familiar with Twohey’s Restaurant, an Alhambra American fare favorite for more than 75 years, which has since relocated to South Pasadena. 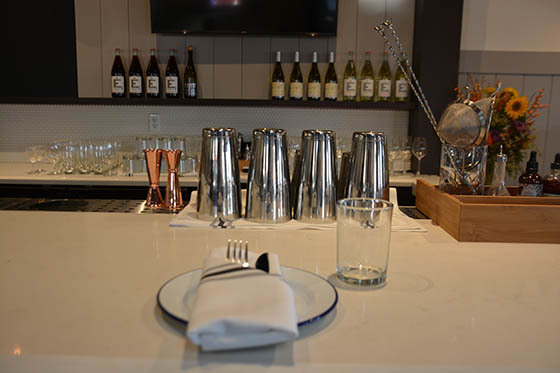 An elevated version of Twohey’s—Twohey’s Tavern—has also set up shop in Pasadena and is offering a more elevated menu with a fine cocktail program. Twohey’s Tavern pays tribute to the classic American diner but is by no means a greasy spoon. And that brings us to the star of the show, Chef Travis Limoge. Born and raised in Vermont, Chef grew up in the kitchen of his grandfather’s restaurants, most notably Valley’s Steakhouse, where port wine cheese and roasted chicken were all the rage and weekend brunches were a showcase for his grandmother’s baking prowess. After working summers in the kitchen while pursuing a career in professional snowboarding, which allowed Limoge to experience new cultures and flavors, he decided to finally pursue cooking full-time. This decision led him to Los Angeles where he became Chef de Cuisine at Fork in the Road in Santa Monica, and Mardi at Palihouse in West Hollywood. Chef then subsequently took a pilgrimage to Mexico after his grandmother’s passing, exploring the flavors of the different regions and the restaurants of Alejandro Ruiz—father to modern Mexican cooking. A serendipitous meeting with Chef Ruiz at the airport led to a further five months in Oaxaca learning all about countryside cooking, in both taste and technique. Upon his return to the States, Limoge came full circle with familiar roots at a family-owned restaurant in Twohey’s Tavern, where he seized the opportunity to marry his passion for modern composition and the warmth of his grandmother's table. “The nostalgia is in the taste, but the cuisine is now,” Limoge said of his culinary philosophy at Twohey's Tavern. 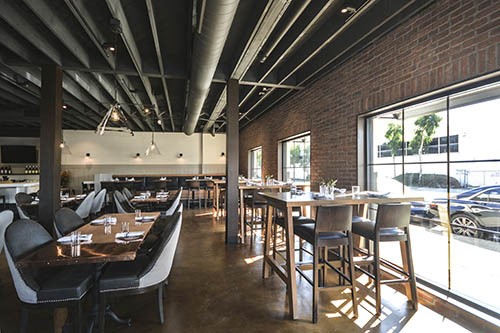 Chef’s menu offers unique elevated versions of classic comfort cuisine. Two standout dishes worth a visit to Pasadena alone include the Fried Chicken, and the Ham Steak. 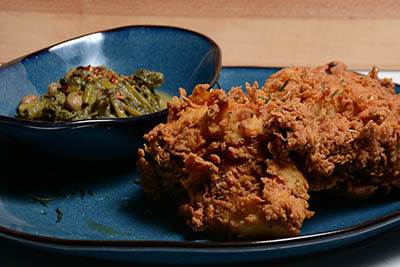 The Fried Chicken is a half chicken served without the bones and is accompanied by braised greens and cranberry beans, and Bill’s Bees wildflower honey. The bones are removed so Chef can use them for chicken stock and the dish, which is prepared unsalted, is so flavorful and the use of honey is just a genius move. 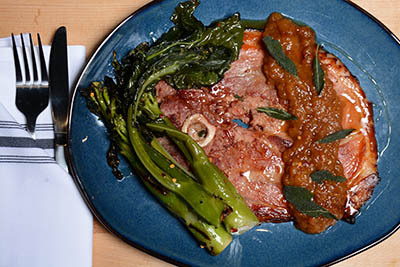 The Ham Steak, which begins with a bone-in ham leg that brines for 15 days and is subsequently smoked for ten hours before getting plated and dressed up with summer peach preserves, sprouting broccoli, buckwheat honey, and charred orange, has been both a dinner and brunch favorite, and arguably one of the best hams I’ve ever had—and I’m no real fan of ham. If you see it on the menu, it’s a must-have. While those are my favorites, they are by no means the only quality dishes. The Starters alone are reason enough to visit. The Creton AKA “poor man’s pate” is served with pickled fennel gelee, fennel pollen, and rye and is an absolutely marvelous spread. 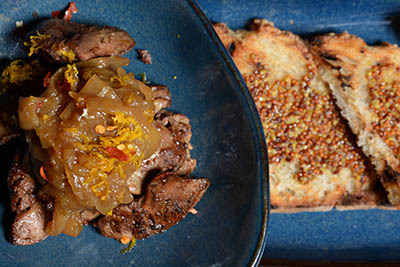 The Liver & Onions, my absolute least favorite dish growing up, is remarkably tasty served with chicken livers, caramelized onion, Worcestershire sauce, and sourdough. The Port Wine Cheese is another sensational spread featuring fresh horseradish, toasted almond, balsamic and sourdough. If you want fine greens, the Roasted Sprouting Broccoli with orange soy glaze, bread crumb, fried caper, soft egg, and cured yolk, is a terrific vegetable option. Craving more veggies? The Roasted Roots entrée served with seasonal root vegetables, green farro, and celeriac puree is a winner! 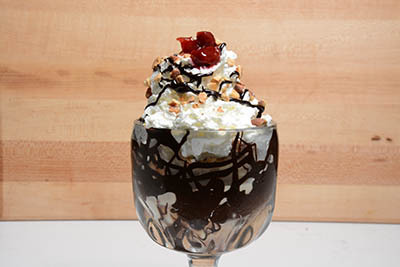 If you save room for dessert, you can’t go wrong with the classics like the upscale Banana Split featuring homemade banana ice cream, banana brûlée, Twohey’s bittersweet fudge, candied almonds, and whipped cream, as well as the Seasonal Sundae with house-made ice cream and seasonal toppings. I love Chef’s flare and his unique approach to elevate and reimagine classic comfort favorites. I can’t wait to see what else he comes up with. 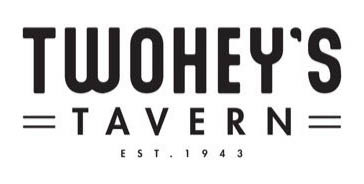 Twohey’s Tavern is located at 2835 E. Foothill Blvd in Pasadena. Open Tuesday through Friday from 11am to close; Saturday and Sunday from 9am to close. Happy Hour is every day from 3pm to 6pm and 9pm to close. Call 626-449-2337.